M2600 Industrial Bike. Same as INB, but frame is taller (20")and top bar design is straight. Fully lugged, hand brazed utilizing 1"" 16 gauge frame tubing with 5/8" rear frame stays. Watching our factory workers in New York weld each frame with such great care is a source of pride for all of us. Our Industrial Bikes feature Exclusive Worksman Clincher Rims, 11 gauge spokes (.120) and much more. These are not toys. These are authentic Worksman Industrial Bicycles. Remember, choose Worksman because you want the best Industrial Bicycles on earth, with components that are more heavy duty than any other bicycles. Worksman Industrial Bikes are proudly made in our Solar Powered New York City (Ozone Park) factory. Great bike. Very sturdy (I'm a BIG guy... got me cycling and moving again.) Totally durable, steel frame, big thick spokes, a chain you could hoist a cargo container with. Totally loving mine. I've had it a couple months now, and have had as much fun customizing it as I have riding it. 1. It's geared very low. If you swap out the rear 22 tooth sprocket for a 16 or 17 tooth, it's a big improvement. To do this you'll need to pop a link or two out of the chain. Easy peasy with a couple tools. 2. The stock handlebars might work for some people but I'm 5"11" and man they were knee knockers. Do yourself a favor and get a new set of bars that aren't so swept back. I got some nice tall ones for an upright and comfy sitting position, but there's a LOT of options out there. I'd been considering buying one for years. Should have pulled the trigger earlier. If you're on the fence, just do it. My family bought this bicycle for me for my 50th birthday. Happy to report that one year and over 1300 miles of city commuting later, I have had ZERO problems. I needed a strong bicycle because I regularly carry loads of 35-55 pounds, which is nothing to the M2600. In contrast, the weight bent the wheels and ultimately broke the frame of my previous bike. Yes, the M2600 is a little heavy going uphill. But it rolls really well; I have exceeded 35 mph going downhill. (That's not really safe, but I just wanted to see how fast I could go.) I got the model with the 7-speed internal gear hub and the coaster brake. Both were good choices. Changing gears is smooth and reliable, and stopping is guaranteed even in the rain. The wide tires really show no wear. The bike does not draw much attention--except for the old guy at the corner bicycle store who knew what a Worksman Cycle is. "Well, look at you!" he exclaimed as I rode by. I wish I had gotten this bicycle 20 years ago. 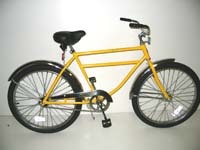 I ordered this bicycle for my 23 year old son, who has some physical and developmental disabilities. This is the second bike I have purchased from Worksman. My son loves to go for long rides and the "extras" that Worksman can build in make it easy for him to do so. The bike is very sturdy, the tires are ultra strong and sturdy, the seat is wide and comfortable, the pedals have flashers, he has a basket to carry things and the single speed model suits him as he cannot shift gears properly. His previous Worksman bike lasted 7 years and they were 7 hard years - he bumps over curbs, rides over rough ground and does not always treat his bike with care. I have recommended Worksman to other families of children with disabilities and will continue to do so. I started to notice while riding my bikes of the last 15 years or so that I kept getting flat tires and bending rims. I mentioned this to my brother saying to him that I didn't recall the quality of bikes being so bad when I was a kid and use to ride American made Schwinns. To which my brother replied, "you didn't weight 300 pounds back then so that may have something to do with your bikes breaking. Well. . .they aren't breaking anymore. The spokes on the M2600 are as thick as the ones on my old BSA motorcycle. The chain looks like the timing chain on my Chevy truck. It is truly an Industrial Bike. I love it. And now that I'm in New Hampshire and not Brooklyn I should be able to hang on to it. ***HIGHLY RECOMMENDED*** I scoured the web for a bike made in the US, all the options were well over $1000, before I found this. In my order online I asked if I could pick up my bike at the factory I live near to avoid shipping, your man did me one better and let me pick a floor model at a nice discount, threw in a T-shirt too. The bike takes quite a beating and keeps on grand. Canâ€™t beat that American craftsmanship, or the feeling knowing it wasnâ€™t made in a sweatshop. Canâ€™t speak more highly. I really like the bike. Customer service needs to be improved. The website doesn't mention up to a 30 day "manufacturing time." Then the drum brake front wheel came with an incompatible fork. More delay. There was no shipping notice, no tracking info and the shipment required a signature. None of this was mentioned when placing the order on the web. I'm a big guy and I've been looking for a bike to hold my weight. Almost all the other bikes have a weight maximum of 250 pounds. The Worksman I bought has a weight capacity of 500 pounds, and it can take a beating. I love it. Very high quality and has all the bells and whistles. Highly recommend. Excellent support, too! I have wanted one of these bikes since I was a paperboy, just never could seem to come up with enough money. Now at age 50 I am not delivering papers but have a perfect way to get some exercise with a very high quality made in the USA bike that will last myself and my great grand children many years. I weigh about 500 lbs, and I thought finding a bike that would support my weight was never going to happen. Surprise! The bike I purchased, with the recommended upgrades, is amazing! Especially the oversized saddle seat. Riding a bike at this weight isn't easy, but I can do it thanks to the folks at Worksman!